Young art students have brought a splash of colour to accompany a brand new CT Scanner in the Chesterfield Royal Hospital's Imaging department. 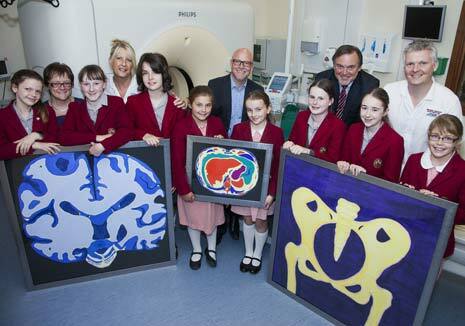 Year five and six pupils from Ashdell School in Broom Hill created three images based on CT scans provided by the Royal's radiographers, that will be hung in the x-ray waiting area. The pictures arrived just a day after a brand new second scanner was opened to patients that will help cope with demand and ensure a more efficient department. The youngsters embarked on the project with the help of Heather Harris, Consultant Radiologist at the Royal whose daughter, Katie Edwards, was one of eight to create the works of art. Heather said: "We thought it might be a good idea to brighten up the place, whilst getting the kids involved in an art project that also taught them a little bit about the human body and some of the work I do here in the hospital. The artwork they've created is really very striking and a wonderful interpretation of the images we gave them to work with." The delivery of the pictures coincides with the introduction of the new scanner that was opened to patients on Monday 1st July. It cost close to £800,000 for the scanner, building work and software and it will work alongside the old scanner to help cope with the number of emergency admissions and allow for a more efficient service. David Tipper is the Clinical Services Manager, he said: "We are very pleased with the investment in the new CT scanner and additional staffing. The new scanner is the very latest in CT Scanning technology and has a wide range of clinical applications. "Linked with faster scan times, better image quality and operator usability, the new scanner will be invaluable in accommodating our current 15,000 CT examinations per year and provide opportunities for further expansion and development, such as the increasing requirement to move towards a seven day service. Heidi Wragg is the Head of Art and Science at Ashdell School and she said: "We're delighted to have been invited here to see the scanner and find out more about how it works. The entire project, completed by the children in our after school art club, has been fantastic in terms of cross-curricular working and to see them create a large image from an A4 design has provided them with new technical skills. Hopefully we can be involved with further projects at the Royal." The second scanner is already in use and has been placed in the purpose-built clinical area that was created when the previous scanner was brought in five years ago. The original scanner will be back up and running in mid-July.